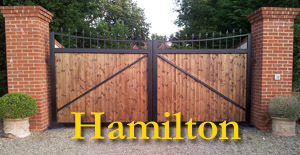 Our latest wooden gate, The Hamilton. Wooden gates by Hampshire Gates are not only functional and stylish but offer a sense of privacy and protection. Those who want to know that their house and land is safe from prying eyes choose wooden gates and fences. We make wooden gates to any width and height often over 5ft tall. This is great for anyone who is worried about their privacy, or just wants to be sure that their dog cannot jump over it. The Amport Gate is finished with quality smooth finish timber from sustainable sources, which gives a traditional but modern look and will compliment any driveway, business and property. Available in 4" x 2" outer frame and heavy duty 4" X 3" outer frame for automation.